Disney and NASA have partnered up a couple times in the past. Once with giving NASA The Avengers to uplink to the International Space Station for six cosmonauts to enjoy. The second is developing hands-on activities about living on the Space Station, using Buzz Lightyear for the fictional yet educational voyage for children. 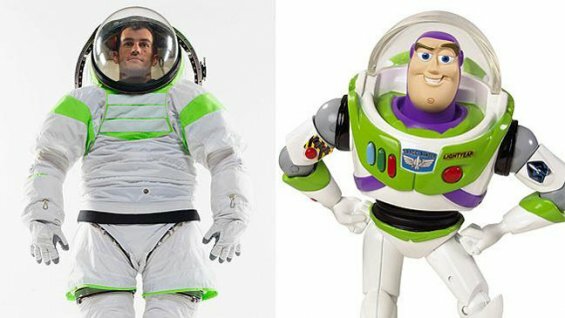 NASA’s next generation spacesuit, the Z-1, bears a striking resemblance to Buzz Lightyear’s spacesuit. It’s designed for long missions in deep space, with a rear-entry port for docking with shuttles and space stations without needing an airlock. In other words, it’s sounding more and more like Buzz Lightyear. It just needs a laser. Where was I? The Z-1 is still in its prototype phase, and will be used in actual missions in 2017. And who knows how many children will suddenly want to be an astronaut; it’s genius.